The most common search term that leads people to our site is "toast." Link below the picture to read more about this oddity. Way back in our early days (about a year and a half ago), Steve made his first post to the site. It was a simple test post (that I almost deleted because it had no real content) that has a bit of text and a picture of toast. Nothing more and nothing less. Somehow, this did a couple things for the site. First, we are the second highest result in a Google image search for "toast". 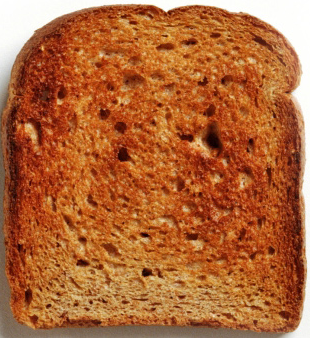 A Bing image search for toast ranks us at #5. A Yahoo image search on the other hand doesn't even put us in the top 200 results. The obvious conclusion here is that Yahoo has the most accurate image search engine. They are the only search engine that realizes we have NOTHING TO DO WITH TOAST! Although we do think it's tasty. Maybe I should do a post about "Yakitate!! Japan", after all, one of the episodes does cover toast. It's also a pretty great anime despite it being mainly bread-based. yeah toast! lawlz. i searched for toast too. It's true. I was searching for toast. All around the country coast to coast, people always say what do you like most? I don't wanna brag I don't wanna boast, I always tell 'em I like toast!